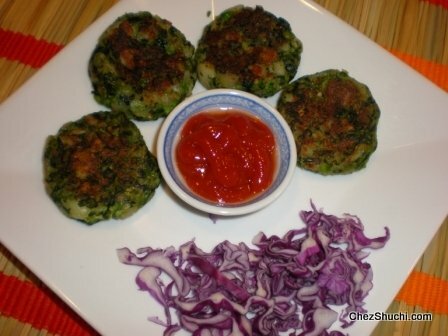 Potato cutlets- a very simple and most popular variety of vegetarian cutlets from India. Last weekend we visited our friends Ruchi and Sushil and they had made these cutlets for us with tea. These cutlets reminded me of Kanpur . When we were there we used to make these cutlets often in monsoon. I was surprised to see that these cutlets were not here in the website so here they are for my readers. Thanks Ruchi for bringign back the taste of home!!! Peel, and grate/ mash boiled potatoes thoroughly. Remove the thick stem, wash, and finely chop the green chilies. Add salt, chopped green chilies, chopped coriander leaves, red chili powder, chaat masala, and garam masala in the boiled potatoes. Sprinkle some water on bread slices and mash them. Add the bread in the potato mixture. Make 16 cutlets. The shape of cutlets can be round, oval, flat as desired. Keep them aside. Heat oil in a wok on medium- high heat. When oil is hot place potato cutlets in the hot oil one by one ( depending on the wok's size) . Now deep fry the cutlets until golden brown. Drain onto kitchen towel. Delicious potato cutlets are ready to serve. Serve hot cutletss with mint chutney,and tamarind chutney or may be tomato ketchup. .
To make these cutlets super crunchy add some rice flour. You can shape potato balls in advance and keep it in fridge and deep fry them as needed. If you do not like to deep fry, cook these cutlets in the gridle/ tawa with a very little oil.